This quote from a parent of a current Fletcher student highlights exactly what sets us apart. The Fletcher School is more than just a school, it’s a community, a family. Moreover, it’s a place of extraordinary potential—a joyful learning environment lit by the smiles of our students. You need only spend a few moments in our corridors or classrooms to hear, to see, and to understand what makes Fletcher so unique. We are an independent, K-12 school offering a college preparatory curriculum for students with learning differences. Our comprehensive program is designed to build the academic, social, and emotional competence of our students. Fletcher Falcons are assured in their abilities and strengths, and stride forward with purpose on the path to fulfillment and life success! Our teachers are certified in the Orton-Gillingham approach to learning. Using this proven method, instruction is sequential, cumulative, and repetitious in order for students to achieve mastery. Individual and prescriptive plans of instruction are developed for each student. Multisensory learning techniques are the basis of this method, and school-issued, 1:1 Apple® devices support and enhance our students’ learning. 1 in 7 kids is diagnosed with a Specific Learning Disability in the U.S.
Children with learning differences see the world differently and are often described as “out of the box” thinkers; SLD’s are also very common. Albert Einstein, Winston Churchill, Anderson Cooper, Charles Schwab, Ted Turner, and Leonardo da Vinci are several notable and influential people with diagnosed learning differences. With the right support and intervention, children with learning differences excel to reach their full potential both in school and in life! Having worked in eight different school settings, both public and private, I can say with confidence that The Fletcher School touches the lives of students and their families in a way that is truly unique. Fletcher students are taught to understand how they learn and develop the skills to become lifelong learners. Here at Fletcher, we are a community of truly dedicated, caring and passionate professionals, parents, and students. Our beliefs in the Fletcher mission and values do not waiver. Our values of student success, quality teaching, care and encouragement are present in every classroom, every hallway, and every school activity. These values form the basis of deep, trusting, and transparent relationships between students, teachers, and parents. We are constantly listening to and learning from our parents and students. An open dialogue between students, teachers, staff and parents ensures our students’ success. This full transparency around student learning and each child’s unique experience, during and after school, ensures that each child meets their full potential and allows a unique, healthy bond to form between the student, their parents, and their teachers. Students are encouraged to share what they are good at and collaborate with others. For example, if one student is good at art and another is good at technology, they are encouraged to celebrate their unique skill and use it to help others. Moreover, a small class size and individualized teaching allows teachers to accommodate the different learning styles of each student by assessing their progress via different tests. 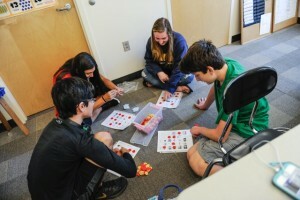 Students, especially in the Upper School, are encouraged to determine how they learn. In doing this, they learn about themselves, what makes them unique and “what’s best for me”. This is the first step in exercising self advocacy. At Fletcher, everyday we practice and teach the importance of self advocacy across every aspect of daily life (work, school, social life, etc.). The Fletcher School is a supportive community of students, parents, teachers and staff who are all working together to ensure the success of our students, each of whom work hard every day to reach their full potential. At Fletcher, we are more than just a school, we are a community.